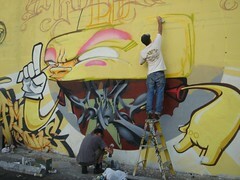 Crewest Gallery News: The Italians Are in Town! The Italians Are in Town! Mr. Wany and Sirtwo in action.. The LA Goldrush is on with the Italian Masters! 22 Italian friends on Whittier Blvd. in the heart of East Los.